YOU, being a shrewd buyer, are looking for top quality mixed martial arts / muay thai training and protective gear at a bargain price, and guess what? KO FIGHTGEAR is looking for you! KO FIGHTGEAR is often spoken of in tandem with the "prestige" Mixed Martial Arts and Muay Thai suppliers. In fact, fighters that have trained at a particular "prestige" brand's Thailand camp prefer and buy our Thai Pads. The design of our EZ On/Off Thai Pads is revolutionary, as it allows one person to conveniently put them on and take them off with no assistance. Our gear is well known for innovation, durability and product design, backed by excellent customer service. A sale is not concluded until we're informed that the customer is 100% satisfied with their purchase. "KO FIGHTGEAR is built like a tank"
"I'm pleasantly surprised by the construction, the high quality leather and also the attention to detail, specifically the stitching"
Note - These are actual customer comments. 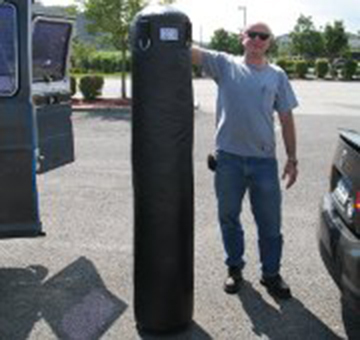 Owners compliment us on how well KO FIGHTGEAR holds up in the demanding MMA school environment. Our gear is rated for medium to advance skill levels, and would be an excellent starting point for beginners. The success of our business is based on "Word of Mouth" advertising by satisfied customers. We receive outstanding reviews on the MMA Forums and within the Mixed Martial Arts and Boxing communities. When you hear fighters speaking highly of KO FIGHTGEAR, or recommending our gear on a fight forum, you know it came unsolicited and "unpaid" for! We are proud of the fact that serious mixed martial arts fighters and boxers are our best advertisement! Among our customers are the US Armed Services, Law Enforcement and University Athletic Programs, all of which we sell to directly. With KO FIGHTGEAR, you don't have to be privileged to own "premium" gear. Remember, if you're going to spend your money, spend it wisely. KO FIGHTGEAR is your best choice. "Beauty is in the eyes of the beholder. ", and you're looking at one stunning thai bag. Here's Neil providing vertical support. This was a big day. Peter M. drove down from CT for his 150 lbs. bag, and was kind enough to take the pic.